More and more people here in the UK are longing for that perfect Hollywood smile. Safe and professional teeth whitening treatments are effective and successful ways of transforming even the dullest of smiles. However, many people have been turning to the wrong kind of teeth whitening products and experience dangerous and harmful results. To protect the health of your teeth and gums, Wimpole Dental Office provides safe and professional teeth whitening in London. We use the cutting-edge and innovative enlighten whitening procedure that can transform your teeth into the whitest shade possible! 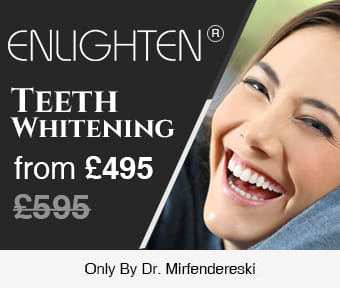 Termed “bleachorexia” by sensationalist tabloids, the obsession with teeth whitening products has become dangerous for many people simply trying to achieve a brighter smile. Over-bleaching teeth with illegal home whitening kits causes teeth sensitivity, receding gums, and loss of tooth enamel - a vital mineral that can’t grow back. To avoid jeopardizing your dental health, it’s important to always visit your dentist for safe and professional teeth whitening. As the demand for the perfect smile initially began to grow, more and more outlets began offering teeth whitening treatments. The techniques and ingredients used by these unqualified and unregulated operators often resulted in serious infections and even caused irreversible damage to the tooth enamel and gums. To put an end to harmful teeth whitening practices, the EU council directive passed a law in 2012 stating that it’s now illegal for anyone to use hydrogen peroxide in a concentration of more than 6%. Most teeth whitening solutions use hydrogen peroxide. Only a licensed dental practitioner can whiten teeth with a concentration of hydrogen peroxide higher than 0.1%. At your initial consultation, our experienced and skilled dentist will examine your mouth to ensure you’re a suitable candidate for whitening treatment. Your custom mouth tray will then be crafted from a mould of your teeth. This tray will be filled with hydrogen peroxide gel which will cover your teeth evenly and avoid contact with your gums. After your treatment, you’ll receive advice and support from your dentist at a number of follow-up appointments to ensure the success of your treatment. With correct after-care, professional whitening can last for up to three years. Are you ready for safe and professional teeth whitening? Then get in touch with our private dentist at Wimpole Dental Office in London today!